Can the Flintstones and Jetsons Sell America on EVs? New ad campaign brings back two classic cartoon families. The Electrify America ad campaign plays up the fun-to-drive aspects of battery-cars as much as their environmental benefits. There’s an electrified revolution heading for your local showroom, with dozens of hybrids, plug-ins and pure battery-electric vehicles coming to market over the next few years. The challenge the industry faces is getting consumers to plug in. All forms of battery-based vehicles accounted for barely 3% of the total U.S. market last year. Building awareness is a key goal for Electrify America, the project backed by $2 billion from Volkswagen, part of the settlement of its diesel emissions scandal. 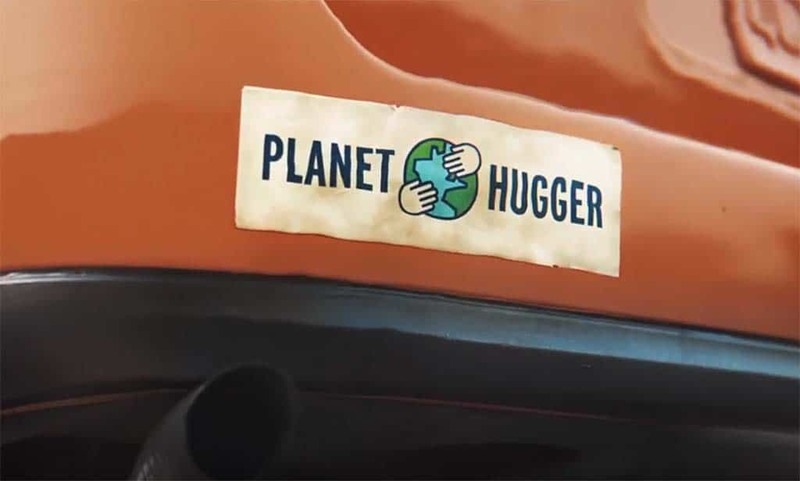 The 10-year effort makes its public debut this week with an ad campaign pitching the virtues of battery-electric vehicles. And to help get the message across, it’s borrowing the theme music from two Boomer-era cartoon shows, the Flintstones and the Jetsons. The first spot, dubbed JetStones, features a number of new battery-electric vehicles, or BEVs, and will air on national and local cable television, with a radio version running in both English and Spanish. At the same time, Electrify America will begin placing a network of high-speed charging stations across the country. The campaign may be funded by VW but it features EVs from a variety of manufacturers, including this Chevrolet Bolt EV. The project is aimed at addressing what is often described as the chicken-and-egg problem facing proponents of plug-based vehicles: without a network of charging stations, it will be difficult to have battery-cars serve as a true replacement for gas-powered vehicles. During the first of four “cycles” over the course of the next 10 years, Electrify America plans to install over 2,000 DC fast chargers at 484 locations across the country. These include hundreds at WalMart facilities, as well as along two major routes connecting the East and West Coasts. Significantly, each of those chargers will be capable of delivering up to 350 kilowatts of power, enough to deliver up to 20 minutes of range per minute, addressing another challenge, the slow charging times of today’s battery-cars. The venture, which is based in Reston, Virginia, isn’t alone. Commercial ventures, such as ChargePoint, are also setting up charging stations across the U.S., as is Tesla, with its Supercharger network. That has already begun making it easier for EV and PHEV owners to start extending their range of travel. Getting the message across is the other mandate for Electrify America, according to Richard Steinberg, the project’s marketing and communications chief. The Flintstones theme music is meant to signify the primitive technology of today, with the Jetsons theme underscoring the idea that the future of transportation is already here. None of the characters from the two ‘60s-era Hannah-Barbera cartoons actually appear on screen. The new campaign will be backed by a push to install over 2,000 super-fast EV chargers across the U.S. in the coming months. 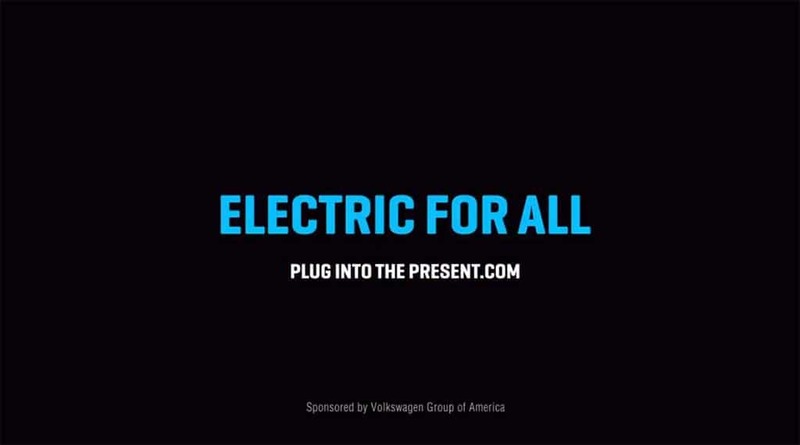 Significantly, though the $2 billion fund backing Electrify America comes from the VW settlement, the German automaker does not play a lead role in the ad campaign. 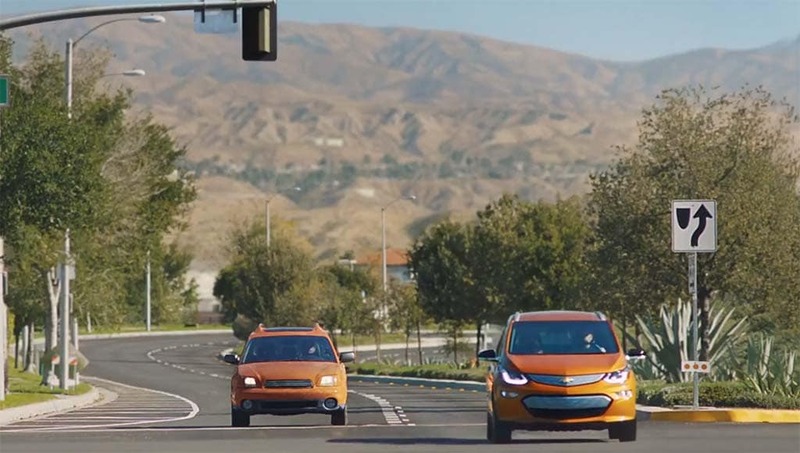 The first TV spot opens with a Chevrolet Bolt EV pulling alongside a conventional gas-powered vehicle. The spot ends with an array of battery-cars from different manufacturers flying by. “There is no pivotal (single) brand associated with the campaign,” stressed Steinberg. Visitors to the Electrify America website will find links directly to the sites operated by each of the various automakers whose products appeared in the new TV spot. Electrify America plans to steadily update its twin mandates – to set up a battery-charging network and build consumer awareness – reflecting the anticipated growth in EV availability, as well as improvements in battery powertrain technology. According to studies by research firm IHS Automotive, there will be 46 EV models on the road by the end of this year, with 70 available by 2020 and 258 coming by 2025. This entry was posted on Monday, August 13th, 2018 at and is filed under Automakers, Automobiles, Business, Celebrities, Chevrolet, EVs, Electrified Vehicles, Environment, Fuel Cell, Fuel Economy, Markets, Personalities, Sales, Technology, Trends, U.S./North America, Volkswagen. You can follow any responses to this entry through the RSS 2.0 feed. Both comments and pings are currently closed.